Disney Movies Anywhere App | A Savings WOW! Download the new Disney Movies Anywhere app for free in iTunes right now and watch the Incredibles movie for free (for a limited time)! 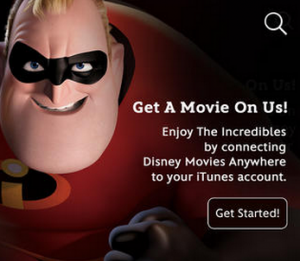 In order to watch the Incredibles for free, you have to connect your iTunes account to the app. It will walk you through how to do this and once they are connected, you’ll have an option to play the movie. Plus, you can download the movie Frozen on Digital HD from it right now!